It’s a new year – and lots of folks are trying to live a healthier year ahead. I am too – not as a formal resolution; those tend to just make me want what I can’t have even more! LOL. But realistic Copic coloring fruit seemed like good inspiration…and it did lead to cravings for pears! Mmmmm good! When Enjoy the video below, or click HERE to watch it in HD on YouTube. The pear was one of my favorites; I love that the colors go from yellows to pinks to oranges to greens! The water drops on the pear surprised even me – yeep! Don’t you love when something like this happens? 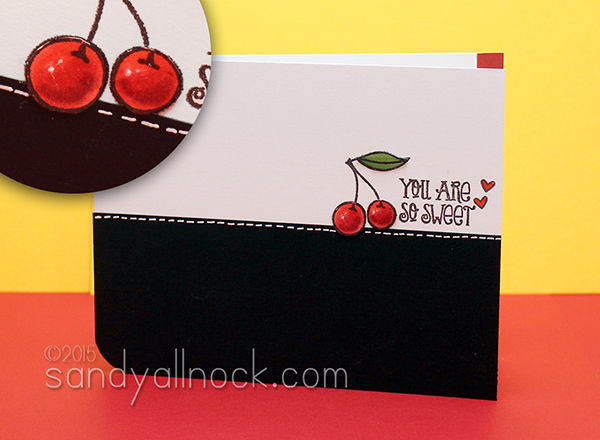 Cherries are just like any round objects we color…they just need shadows and little highlights! Last but not least, the lemon! 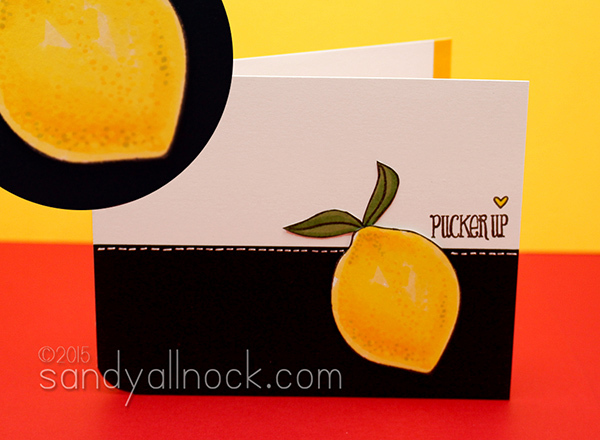 The pores on lemons were a surprise to me; if I had been asked before this realistic Copic coloring exercise to describe the look of a lemon, I wouldn’t have said it has pores! A note about this stamp set – the sentiments in the set generally fit inside most of the fruits. I left them all outside, so my coloring would show. After that kind of work you don’t want to hid it! I’ve linked up each stamp’s colors separately below – and I’ve also linked the dies too, in case you’d like them – I wanted mine cut allll the way to the edge so I did my fussycutting for these cards. Finishing touches for all four are in the bottom section. If you wanted to learn realistic Copic coloring – what would the image be? You have the BEST tutotial and information. So glad I found you!! You did it again Sandy! You never cease to amaze me with your coloring. Those fruits look good enough to eat! Thank you for yet another coloring video. Keep them coming! Absolutely fantastic…love the dew on the peach the best! So realistic, yet still fun. And I’m loving your CAS designs here, although hard to classify them as ‘simple’ with your superb coloring skills! TFS. Gorgeous! I am so glad you left work and pursued your dream —- look at what you have accomplished! I am so impressed! After watching you bring these fruits to life I started to crave them! Your coloring is just magical and that dew drop…can’t get over it! Wow–these turned out awesome. thanks for all the tips. Wow you are the Queen of Copics! These fruits are fabulous and look so juicy. My favorite is the peach with the water drops!! I just want to take a bite. LOL thank you for sharing your awesome talents with us. Unbelievable! you made me hungry. The dewy drop on the peach knocked my Uggs off. Sandy, I love to watch you color anything but these fruits are very well done and delicious looking. Way to go, girl! Wow, fab colouring (as usual) and those water droplets do look amazing. Also love the resulting cards. Have a wonderful weekend! OK, now we need a tutorial on water drops. 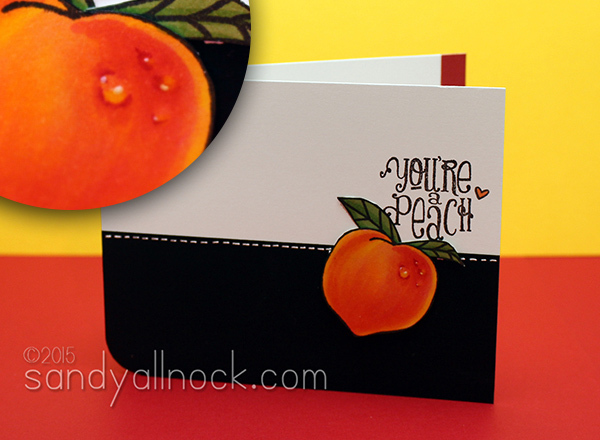 The details on the fruits are wonderful and all the cards are really fun. I would realy like one as well! I vote for a tutorial also! Looking at your videos is the high point in my day! I just received this stamp set last week – so I’m SOOOOO glad you did this video – and the research you put into the different fruit colorations – Mother Nature is amazing! Also, thank you for putting separate supply lists with each fruit – helps a lot! Now I’ve gotta go try to color a drop of water…!